After saying a tearful goodbye (Gerda & Christa) to the Grads at the Rome station, Harlow still not feeling well, we continue to Naples train station where we grab a taxi to the Harbour Port for the hydrofoil ferry to Sorrento. This taxi has to be the wildest ride we have ever taken …… it’s a wonder the driver didn’t hit any vehicles, buildings or people. Brian had calculated 45 minutes to get a taxi and get to the port (based on other’s experience) ….. it took us 15 minutes! Gerda said she just closed her eyes a lot! On another note the train station and area between the to the Port dock has to be one of the most littered and maybe one of the most dirty (lived in?) areas we have visited …… not sure if it’s always this way or if we just happened to catch the city with its pants down. The port area is better ….. marginally, it seems to run smoothly. 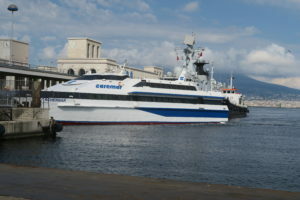 We had to wait an hour and a half because we got there so early …… the hydrofoil was on time; however, they didn’t mention we would need to pay extra for our luggage ….. one guy says €3.1 another says €2.1 …… poorly run. The boat was packed, so we ended up in the middle near the back. When it left the pier, it did a turn on a dime ….. amazing how such a big vessel could turn so quickly and with precision …… then moved slowly through the harbour to the entrance. As we moved through the entrance the boat was hit by two huge waves …. It was like a roller-coaster ride …. several women screamed and most people gasped. Not expected …… the rest of the trip was uneventful and fast …. 40 minutes pier to pier. We arrived around 6:00pm, catching a taxi from just off the pier to take us to our hotel …. 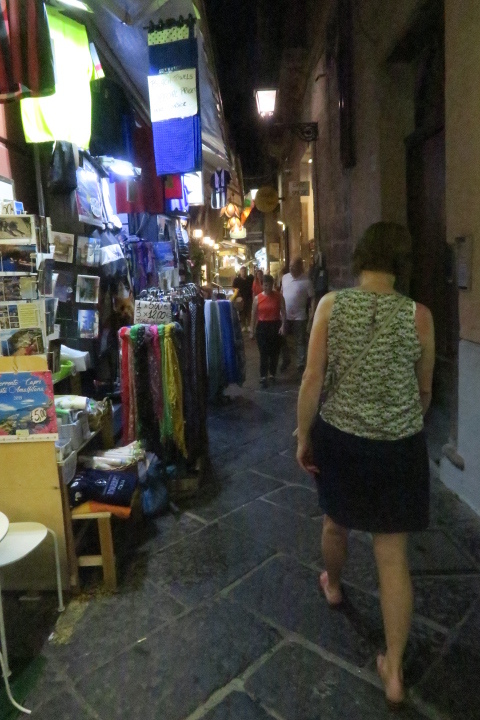 we had considered walking, but quickly realized that it was very difficult due to the steep, cobblestone roads. The ride in was on a narrow, “hair-pin” road ….. of the same cobblestones. As the crow flies it’s about 500 meters ….. unfortunately the taxi doesn’t fly so it was over 1 kilometer – not far but still expensive. Once we’re pitted in to our room …. a quick shower and a nap to recoup from the high humidity and heat …… feels like 39°C – you’re always wet. Then it’s off to dinner at one of the many restaurants. The food was good, the service was okay ……. so we moved on to souvenir hunting. A quick check-in, and the manager gives Gerda a rose. He then accompanies us to our room to explain how everything works ….. it was a good thing in that we would have wondered about the air conditioning …… it shuts off if the window is open and that’s one of the first things we do in our rooms. Be aware WiFi is free – only in the lobby – it’s €3 /day for your room. Also be aware there is a safe in the room …. you can use it for free but need to rent a key to lock it (yep … for real – only €2 per day). Time for another shower and a rest to cool down … by 7pm we’re out wandering around and find a restaurant by 7:45. Gerda has the salmon while Brian has the braised duck …. white wine (why do they call it white when it clearly has no color?) to cap it off. All followed by a stroll up and down a few of the streets. Gelato with homemade cones helps us find our way back to base camp. This has to have been our most spartan room on our trip ….. but a room is a room … we generally spend as little time as possible in the rooms. By the time we turn in for the night the room is very cool and refreshing. 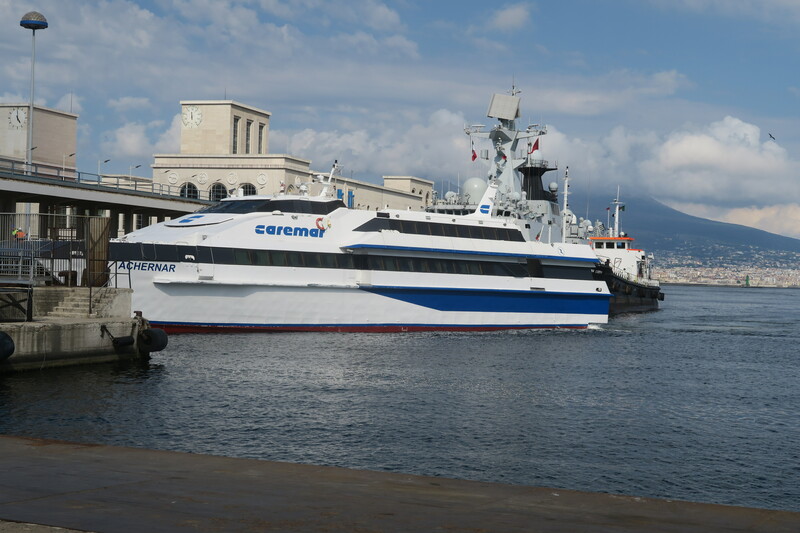 Up earlier than normal today ….. booked for the 9am ferry to Capri. Man is it muggy (hot and humid) out ….. we are sweating by the time we hit the pier. The boat is full to the gills, however it only take 20 minutes to get there. 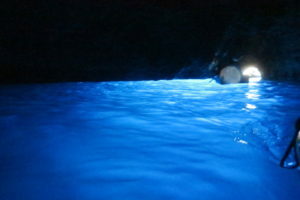 After debating we wander for a half hour, then decided to do the “Blue Grotto” tour – 90 minutes at €15 ea. We buy the tickets and just catch the next tour boat. After 35 minutes on the small boat we arrive at the site, where the guide announces that we could be there another hour as there are too many boats trying to drop passengers. However the trip ends up being well worth it …. Couple of the boats leave and we move up the line for access. At this point the boat operator informs us that if we want to go into the Grotto, we will have to cough up another 14€ each and give the small boat rower a tip also. We decided (like most of the people on the boat) to go into the Grotto … ka-ching another 30-35€ spent in a flash. 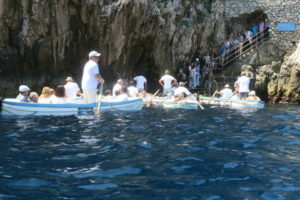 Once it’s our turn to go in to the grotto, the row boats pull alongside the tour boat and we stack 4 to 5 people in each. Then it’s over to the ticket boat to pay …… man it’s wild – their boat going up and ours down, hard to exchange cash for tickets …. but we get it done. The row boat operator informs us we have to get as low as possible in the boat so we don’t wack our head on the low entrance. We wait as 10 boats come out and then we go in – one of another 10 boats. See they only allow 10 in at a time. When you are in it’s an amazingly beautiful blue reflection throughout the grotto. Our 10 minutes are up and then we move out so the next 10 can come in. The row boat operator gets us back to our tour boat (reminding us to give him a tip – I guess a form of piracy) … then we are back on our boat. The tour boar operator starts to pull away, when one of the passengers insists that an American family has been left behind. The operator finally concedes and goes back … sure enough there was the row boat and the Americans. It’s a quick trip back to the harbor and we go for lunch at a restaurant over looking the harbor and beach with stunning views. 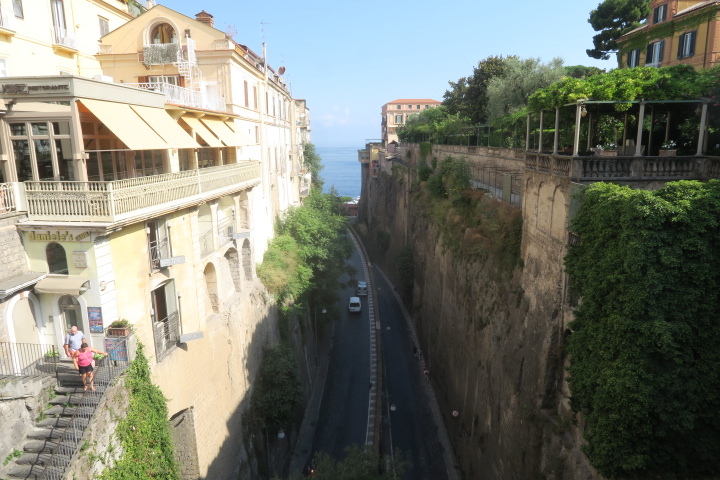 From there it’s back to the ferry pickup and the ride to Sorrento. 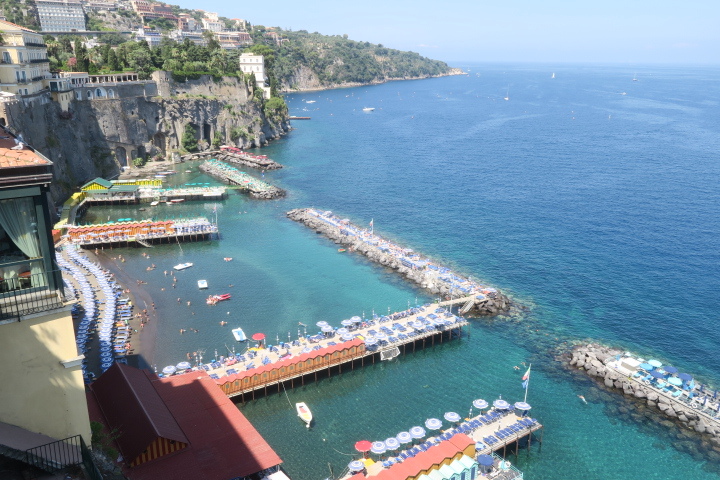 Upon debarking from the ferry in Sorrento, we decided to look at the “beaches” to the west of the pier. They are a unique blend of rock islands supporting boardwalks on which the owners have placed umbrellas and loungers that can be rented – an inventive way to create the beach feel and make money! This “beach” area can be reached through a tunnel in the cliff and walkways that come down the cliff side from the tunnel … or …. an elevator through the same cliff structure. Of course we walked up – each level giving a different view of the coast and the “beaches”. On the way back to the hotel we run across a wedding being setup ….. Gerda being the romantic wanted to stay so we could see the bride arrive … 45 minutes later she pulls up in an Alpha Romeo wearing a stunning dress. Gerda is jealous, not because the bride is young and beautiful …. but because she isn’t even breaking a sweat and we are ready for our second change of clothes! …. Time to shower and change. Around 8:00pm we wander looking for a place to eat. 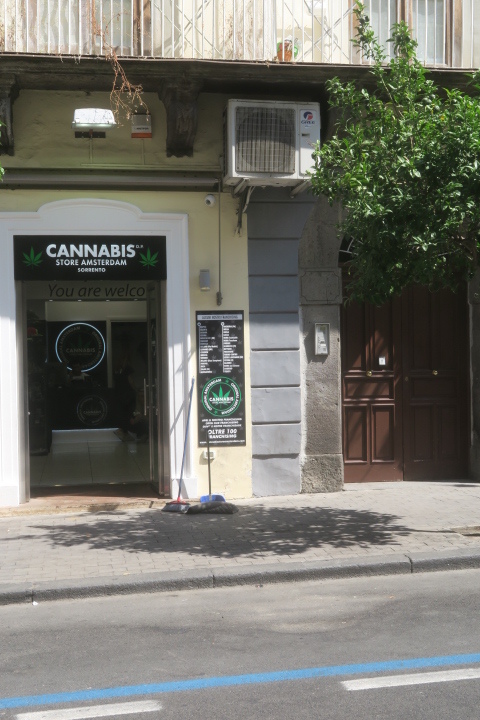 We’ve walked the major promenade “Corso Italia” and wide pedestrian mall – time to look elsewhere, so we go down the narrow “Via S Cesareo” …. Full of booths and many hops, literally selling every thing. We eat in an outdoor restaurant with the motto ‘Friendly service with a smile’ – this is the first restaurant where there were few smiles and ‘friendly’ seemed forced. The food was good, it’s just the service seemed veiled. Whenever this happens, it’s usually because they think we are American; however this time when we subtly indicate that we are from Canadian, it doesn’t seem to matter. So time to move on …. A little more wandering and then back to the hotel. Tomorrow will bring more adventures ………. Today we wanted to go to Pompeii; however we were informed that there was a train strike, so a tour was not in the cards. Guess it’s on the bucket list for future trip …… we know Taylan also wants to see it. The rest of the day is mostly catch and release, although Gerda did buy a gorgeous bathing suit and some souvenir trash we wander mostly back through the “Via S Cesareo” tourist traps. We found out truly how many amazing ways you can spend money ….. spices, clothes, souvenirs, food and …. beer. Afterwards we did a number on the pool so Gerda could try her new suit and we could cool down. Since we forgot that it was Friday, dinner was much later …. 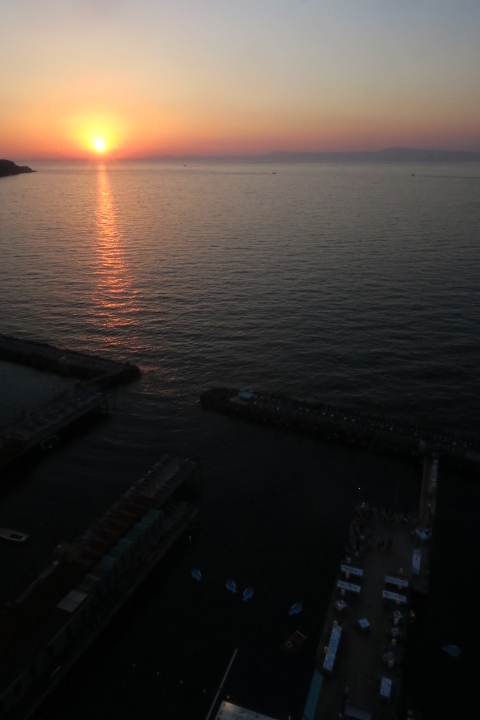 While waiting, we went back to the elevator in the cliff and saw one of the most gorgeous sunsets, with Napoli and Mount Vesuvius on the horizon. Then it was back to the restaurants to see if we could get in even though it was now 9:30. We ended up back at the same first day restaurant … the food was good and the service professional …. and yet you want more than just professional ….. it’s … boring. The restaurant in Lucca was 10 out of ten, this one would be 7. We prepare for average, but hope for the exceptional – not this time. Back to the hotel …… did I tell you that the hotel has wot entrances? One from the cliff side road and one from the main thorough fare. Image our surprise when we return to that door and see the door next to it is …. 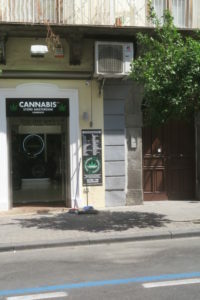 a marijuana outlet! I guess like Holland it must be legal here. We leave the hotel at 7:25 and go to the center lift, the elevator which takes us to the beach level. Again within 10 minutes of dragging our baggage, we are ready for a shower and change of clothes. 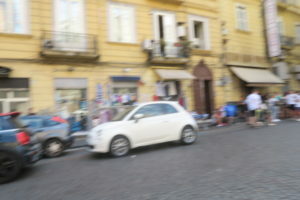 Back in Napoli, the ride to the train station seems to take half the time it took to get to the ferry. Now we have a 2 hour wait …. Which we spend an hour in one of the cafes, where we meet an interesting couple – Sue and Clark. He’s a helicopter mechanic (Sikorsky) and she is an amateur photographer. We spent an interesting 45 minutes exchanging stories … it was a pleasure to meet them.